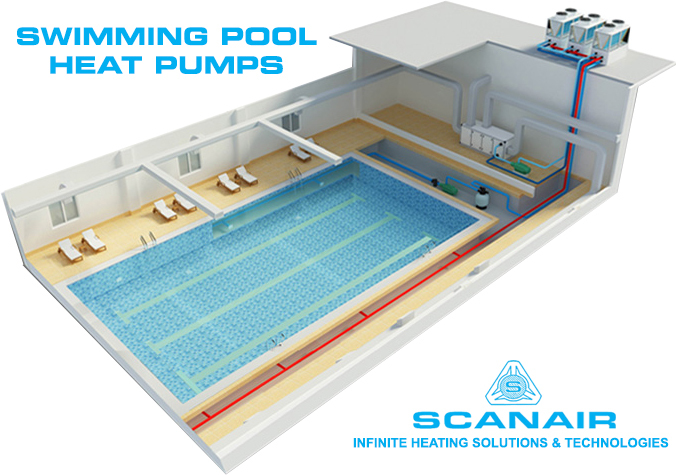 Swimming Pool Heat Pumps warms your swimming pool or spa with Scanair heat pumps and cools during winter and hot summer season reliably and efficiently with the most trusted brand. We are offering to have our client an excellent quality range swimming pool heat pumps. With high-quality titanium, SS 316L grade heat exchangers are made from high-quality raw materials which ensure high durability at its user ends. Our temperature range from 25˚C To +65˚C ± 1˚ C, capacity from 1Kw to 150Kw From50LPH to 15000LPH with different heating capacity widely finds its valuable application in various sectors applicable to swimming pool, SPA or fish, Aqua cultivation, Hatcheries. People install them for pools of their houses. and in GYM are also heated by heat pumps. Even in aquaculture farms, heat pumps are installed for fishes, for they need stable and warm water to grow quickly constant heating and cooling functions. Do you know the earliest success of heat pump water heaters for swimming pools, because the water volume in a pool is huge, so was heating, they need a huge amount of energy. Diesel, gas boiler, electric heater, which is higher running costs not for economical use. Secondly, the water temperature requirement is not high, less than 34 C degree will be OK. In other words, the terminal temperature of heat pumps will not be too high. These two reasons bring the application of heat pumps for swimming pool. In fact, you will say “what an ideal product designed for pools” when you know the performance of this kind of products. The COP of swimming pool heat pumps reaches 5, which means 1Kw electric power consumption can bring 5Kw heating output energy. The number of traditional water heaters (broilers or electric water heaters) will not be more than 1Kw heat energy output. Nowadays, swimming pool heat pumps are popular in India. Why a HEAT PUMP is Prefered over a Traditional water Heater. MEASURING CONDITIONS: Outdoor dry bulb 20˚C/Wet bulb, 15˚C/inlet water temp 15˚C/outlet water temp 55˚C. Advanced corrosion resistance Titanium Heat Exchanger virtually impervious to water chemistry damage we use world famous scroll Emersion Copeland hermetically sealed brand compressor. Digital LED display wire control panel, controls water temperature to within 1˚C to 5˚C difference from set point. On-Off timing function, no human attendance is required for operation once started. Insufficient water flow protection & high/low pressure protection. Auto defrosting, ensure reliably running at cold ambient temperature. Available Refrigerant R 134a,R 22, R 407 C, R 404A, R 410 A. Optional electrophoresis treatment for coastal area, super corrosion resistant. Dart black color can also increase the COP by 10% compared to the regular cabinet.